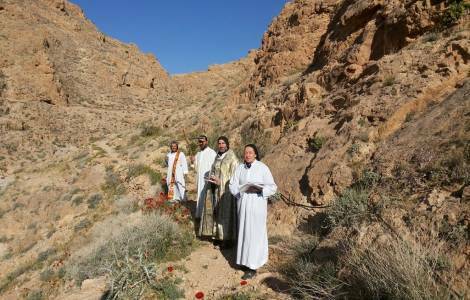 ASIA/SYRIA - Brother Jihad: "The monastic life of prayer and work has resumed in Mar Musa"
Damascus (Agenzia Fides) - "In Mar Musa the situation is calm and even in the Valley of Christians, where I was born and raised, there are no tensions. However, the overall situation of the country is still precarious". Brother Jihad Youssef is a monk of Mar Musa, the Catholic monastic community of the Syriac rite, refounded by Jesuit Father Paolo Dall'Oglio (kidnapped in 2013 and whose fate is unknown), located near the town of al-Nabk, about 80 kilometers north of Damascus. Sharing his impressions with Agenzia Fides, after Easter, the monk states: "There are still clashes in some areas, some of which are fierce, there are many victims, mainly innocent civilians". The situation is dramatic. But even in peaceful areas or those that have never been affected by the clashes, the social situation is not prosperous". There is no work, prices are very high. Families struggle to get by. "Many families are in difficulty", continues Brother Jihad. "Faced with a situation of uncertainty, many plan to emigrate abroad: Europe, North America, Australia. It is understandable, although I think many are deceived by false representations of the West. To emigrate is not easy, and even if one manages to emigrate, life abroad is not easy". In the past few years the monastery of Mar Musa has not been affected by the fighting, and although the activities have diminished the monks have never left. Currently three monks of the community and two religious guests live in the structure. "The flow of visitors have not returned to pre-war levels - he continues - but, especially on Friday (holiday for Muslims), many people, most of whom are Muslims, come to visit the monastery. Big and small groups come to pray, meditate, take a break in a place that inspires reflection and contemplation".